Audiences are giving rave reviews of Rodgers and Hammerstein's "Oklahoma!" presented by Stephen F. Austin State University School of Theatre, School of Music and SFA Dance Program. Performances are at 7:30 p.m. nightly through Saturday, Nov. 10, in W.M. Turner Auditorium on the SFA campus. 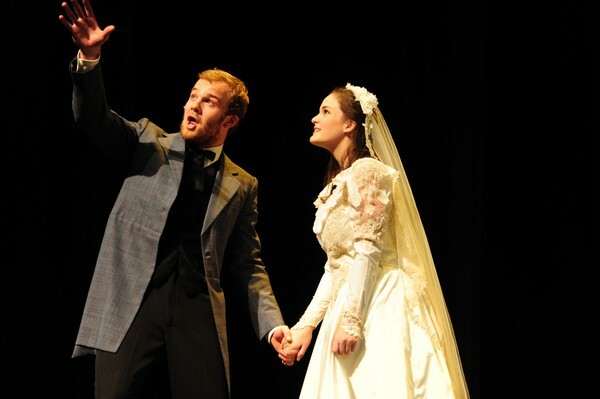 Pictured are junior Thomas Falconar, Rose Bruford American Theatre Arts student from London, England, as Curly, and senior Sidney Lowell of Huffman as Laurey. Single tickets are $15 for adults, $10 for seniors and $7.50 for youth. Tickets for SFA students are $5. For tickets or more information, call the SFA Fine Arts Box Office at (936) 468-6407 or visit http://www.theatre.sfasu.edu/.